Origin and Habitat: Arrojadoa dinae is found in southern Bahia and northern Minas Gerais (Brazil), from north of Rio Pardo de Minas to south of Urandi in Bahia. Arrojadoa dinae has a small extent of occurrence (less than 5,000 km2) and a limited area of occupancy (less than 500 km2), it is found at less than 10 locations, there are less than 10,000 mature individuals in total. Altitude range: It grows at altitudes between 800 and 1,400 metres above sea level. 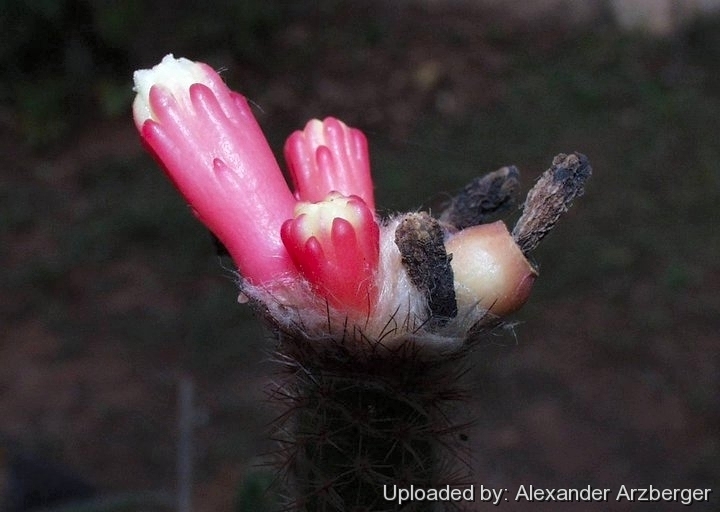 Habitat and Ecology: This cactus is found in sandy patches among campo rupestre and cerrado vegetation. The generation length is around 10 years. The main threats are deforestation for Eucalyptus plantations used for charcoal production. The seeds and entire plants are collected for ornamental use. Collection of the plant and fires can impact on its reproductive capacity, and it is estimated that over 10 percent of the population has disappeared over the course of three generations. Description: Arrojadoa dinae is a low succulent shrub with slender stems, up to 30 cm tall, the stems being covered with yellowish brown spines and greyish-white wool, and even more dense towards the apex where the pseudocephalium develops bicolored, brownish red to violet-pink blooms. Plants are shrubby, basally branching with subterranean tubers. Stems: Thin, cylindrical, to 30 cm long, 1.8-2 cm in diameter. Ribs: 8–11, narrow, rounded, 4-5 mm wide. none. Flowering areoles different from non flowering, tufted with bristles and hairs. Spines: Yellowish brown to white or nearly so, radiating, flexible, 4-8 mm long. Radial spines: About 12, not easily differentiated. Cephalia: With white wool and brownish bristles 1.5–2 cm long. Flowers: Tubular, often bicolored, brownish red to violet-pink, to 30 mm long and 9 mm in diameter, the pericarpel and tube naked, the limb very short, stamen and style not projecting. Fruits: Berry-like, juicy, brownish red, sometimes bicolored, oval to pear shaped. Arrojadoa dinae, Arrojadoa multiflora, Arrojadoa eriocaulis and Arrojadoa beateae are a group of distinct but related species in Minas Gerais and Bahia. They are readily distinguished by their subterranean tubers, stems, wood anatomy, bi-colored flowers, and fruits. Most authors regard them as conspecific under the oldest name Arrojadoa dinae. However some studies in the field, show that it should be better to maintain these taxa as separate species. In some cases they even grow together (A. dinae, A. eriocaulis) without hybridization. Arrojadoa dinae Buining & Bredero: (subsp. dinae) has stems up to 30 cm tall, usually with 11 ribs, whitish spines, and brownish carmine flowers with yellow interiors. Distribution: Bahia. Arrojadoa dinae subs. eriocaulis (Buining & Bredero) N.P.Taylor & Zappi: typically has 8-9 ribs, yellowish brown spines, and light violet-pink flowers. Distribution: Minas Gerais. Arrojadoa dinae var. nana P.J.Braun & Esteves: this is a smallish form strictly related to Arrojadoa dinae subs. eriocaulis. Arrojadoa eriocaulis var. 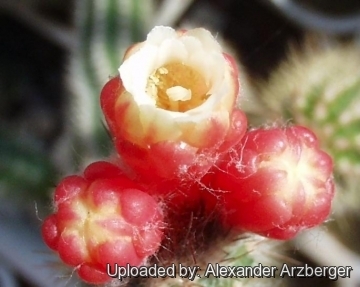 rosenbergeriana Van Heek & W.Strecker: Distribution: East of Mato Verde, Minas Gerais, Brazil. Arrojadoa multiflora F.Ritter: has stems, up to 80 cm tall. Ribs 7-8. Flowers inside pale yellowish , outside somewhat ruby. Distribution: Bahia. 1) Machado, M., Braun, P., Taylor, N.P. & Zappi, D. 2013. Arrojadoa dinae. The IUCN Red List of Threatened Species. Version 2015.1. <www.iucnredlist.org>. Downloaded on 09 June 2015. Cultivation and Propagation: Arrojadoa dinae is not particularly difficult on own roots providing it is given a little extra heat during the winter, but this and all its relatives do best when grafted. Arrojadoas bloom on the forest floor all year-round and are accustomed to receiving lots of summer rain and winter dew, so they never dry out for long in the wild. They most definitely are not desert plants and don't survive if treated as such. In arid climates they fare best in containers, where the roots remain moist longer. Growth rate: It is a relatively rapidly growing and easily flowering species that will make clumps given the best conditions. Soils: It likes very porous standard cactus mix soil and can also be grown in orchid bark, or on cork sheets or a tree branch like for epiphytes. Repotting: Use pot with good drainage. Watering: It should be watered generously during the growing season, keep drier in winter. Water them less than average if in bigger pots. Hardiness: Reputedly sensitive to frost (in his biotope the temperature never drops below 15 ° C), but less so if kept on the dry side prior to, and during, cold weather. However warmth throughout the year will increase the grower's success (not less than 8-12°C during rest season). Exposition: Outside bright, hot conditions or afternoon shade, inside it needs bright light, and some direct sun. Strong light encourages flowering and heavy wool and spine production. - Red spiders: Red spiders may be effectively rubbed up by watering the plants from above. 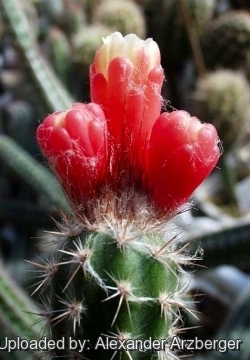 - Rot: Rot is only a minor problem with cacti if the plants are watered and “aired” correctly. If they are not, fungicides won't help all that much. Propagation: The Arrojadoas are quite easy to grow from cuttings, seed or (often) graft. Seeds germinate in 7-14 days at 21-27° C in spring, remove the glass cover gradually as the plants develops and keep ventilated, no full sun for young plants! To make a cutting twist off a branch and permit it to dry out a couple of weeks, lay it on the soil and insert the stem end partially into the soil. Try to keep the cutting upright so that the roots are able to grow downward.